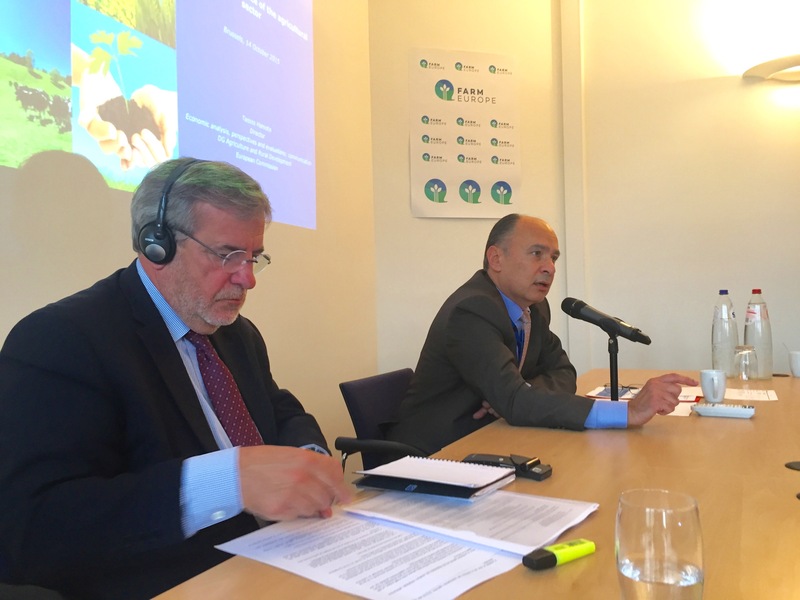 On the morning of the 12th October, Farm Europe hosted an event on growth and resilience in the agricultural sector with Mr. Tassos HANIOTIS, Director at the European Commission in charge of Economic analysis, perspectives and evaluation for Agriculture and Rural Development. Mr. Haniotis outlined the drivers of challenges for EU agriculture, the counterintuitive link of agriculture to jobs and growth and the role of the CAP and its policy responses today, and for the future. Mr. Jean-François ISAMBERT, Vice President of AGRALYS, Vice-President of UNIGRAINS, and President of the European Civil Dialogue Group on Arable Crops, led the debate, drawing some conclusions on the challenges and opportunities for the future of European agriculture around 3 interdependent challenges to the agri-food sector – investment, sustainability, and resilience. Mr ISAMBERT said that “the primary question is not whether or not large agriculture areas will play a greater role in global trade in future, but rather whether they are equipped to do so. On this issue, Europe has a strong responsibility, given its favourable position in terms of both conditions for production and in terms of expertise. Indeed, we have the soil, the climate, and the technicalities that allow us to intervene. It is therefore our duty to provide concrete answers to the question of ‘how’ this may be done”.